The uniform format for visas was initially developed in the intergovernmental Schengen cooperation and taken over into EU law with the adoption of Regulation No 1683/95 on a uniform format for visas. All Member States, including Denmark, United Kingdom and Ireland participated in this Regulation which was based on Article 100 (c) TEC introduced at Maastricht. The integration of the Schengen acquis into the Union and the introduction of “variable geometry” in Union law took place subsequently, on 1 May 1999, when the Amsterdam treaty entered into force. Regulation (EC) No 1683/95 laying down a uniform format for visas took over the design adopted by the Schengen states and sets out in its recitals that these documents have to contain all the necessary information and meet very high technical standards, notably as regards safeguards against counterfeiting and falsification. These measures were taken in the framework of fighting irregular migration. Since the introduction of the uniform format for visas, two substantial modifications to the initial Regulation have been adopted, which have contributed to the issuance of secure documents, fulfilling very high technical standards. The first amendment was introduced with Regulation (EC) No 334/2002 integrating a photograph produced according to high security standards as a first step towards the use of elements establishing a more reliable link between the visa sticker and the holder, as an important contribution to ensuring that the uniform format for visas was protected even against fraudulent use. The second amendment with Regulation (EC) No 856/2008 related primarily to an adaptation of the numbering in order to comply with the requirements of the Visa Information System (VIS). Whereas the security concept for the uniform visa format dates back to 1995, with the above mentioned modifications, high quality counterfeits have recently been detected in several Member States. It is therefore necessary to develop a new security concept and design for a future more secure visa. For a future visa concept it is important to take into account that the current EU visa document is part of the entire visa system including the Visa Information System (VIS), which is still in its roll-out phase. Regardless of the database system it is currently still necessary to have a physical document for the visa. There is still a need for the visa sticker, first because of all Multiple Entry Visas (MEV) which are issued with a long period of validity before the full roll-out of the VIS and secondly, because the uniform visa format is also used for the long stay D-Visas, which are not stored in the VIS and which will remain valid for several years. For those reasons a physical document for the visa sticker will still be necessary for years to come. Moreover, in relation to the current visa sticker, further improvement of the overall security is necessary, without increasing the costs for the document itself. In a very recent forgery case, there were imitations of Spanish, Austrian, German, Czech and Italian visa stickers. The common forgery features are the following: All Kinegrams are genuine, and were peeled off from authentic documents, so part of the original intaglio print and fibres can be seen also on the counterfeits. There were no significant differences in the visible graphics; they were digitalized by a scanner. The visible offset background prints were imitated. The colourless UV print was made by rainbow printing with one cliché. The multi-colour UV fibres were imitated by offset printing on some counterfeits. Specialists of the Member States therefore consider that the visa sticker in its current design is compromised. It follows that it is urgent to develop a new design with better security features for the visa sticker. The committee established by Article 6 of Regulation (EC) 1683/1995 created already in 2009 a sub-committee, with the aim of developing a draft new design with common security features. The subgroup has met two to three times a year to prepare a thorough input for the new design. 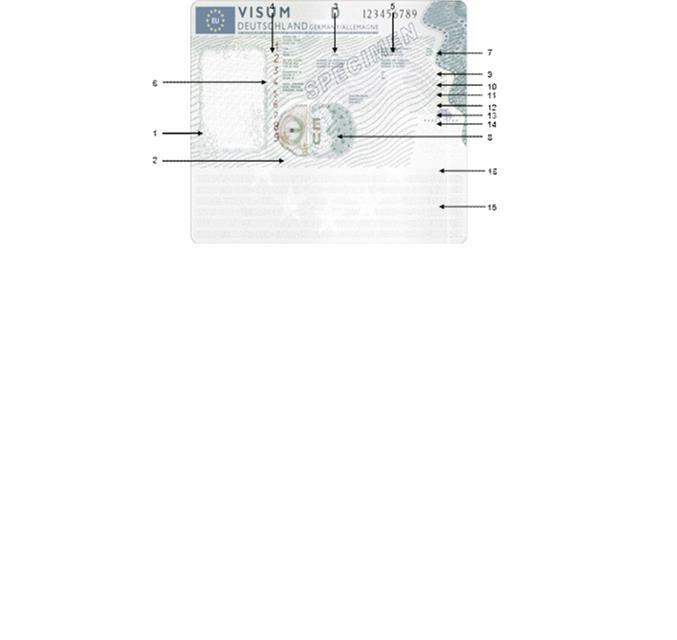 The future technical specifications will enable Member States to produce a new visa sticker with the same (uniform) design, paper and security features. In the new design, the security features are removed from the edges of the sticker into places where they cannot be cut out easily. Furthermore, to mention some of the suggestions for the new design, two numbers on the sticker are suggested, one vertically, next to the photograph using different letterpress in addition to the horizontal one in the top right corner. The Kinegram will be placed overlapping the photo area and overprinted by UV print. These suggestions were made by Member States after a thorough analysis of the most common types of fraud attacks to the visa sticker. This should significantly increase the level of security of the visa sticker. The cost of the future visa sticker will be the same as the current one as some providers agreed to deliver their products for the same price. However, there may be a one-off extra cost for the individual producers in some Member States as they have to adapt the production to the new requirements. Why is no recast proposed? In principle, a third substantial amendment (- counting the technical adaptations on the occasion of the accessions of new Member States and the adoption of the Visa Code the current proposal constitutes the sixth amendment -) should normally be the occasion to propose a recast. In the present case, there are arguments which motivate to deviate from this rule. The main changes will be in the Commission implementation decision, setting out the secret technical specifications for the production of the new visa sticker – secret because fraudsters should not get access to the technical specifications for the production of the visa sticker. There are no substantive changes to the enacting term of this Regulation, only the Annex is replaced to show the new design. There is a need for swift legislative action as the fraudsters are ahead; the visa format needs to be made more fraud-proof. Furthermore, this regulation is of limited interest to the wider public, contrary to major regulations such as the Visa Code. A codification of the Regulation on a uniform format for visas can take place after the adoption of the present proposed amendment, which is urgent. Article 77(2) (a) TFEU empowers the European Parliament and the Council to adopt 'measures concerning the common policy on visas and other short stay residence permits'. Those measures include, as has in the past been textually implicit in the preceding text of article 62(2)(b)(iii) TEC and article 100c(3) TEC, a uniform format for visas. The current proposal is within the limits set by those treaty provisions, and does not alter the scope of Union legislation. The objective of this proposal is to further secure and improve the uniform format for visas in the light of evolutions in the practice of fraudsters. This objective cannot be sufficiently achieved by the Member States acting alone, because a uniform format needs to be uniform and an amendment to an existing Union act can only be achieved by the Union. Article 5(4) TFEU states that the content and form of Union action must not exceed what is necessary to achieve the objectives of the Treaties. The form chosen for this action must enable the proposal to achieve its objective and be implemented as effectively as possible. The establishment of the uniform format for visas took the form of a Regulation in order to ensure that it would be applied in the same way in all the Member States. This proposal constitutes an amendment to an existing regulation and must therefore take the form of a regulation. As to the content, this initiative is limited to improvements of the existing regulation and based on the policy objective of fighting irregular migration by rendering documents more secure against counterfeiting and falsification. The proposal therefore complies with the proportionality principle. This proposal amends Regulation (EC) No 1683/95 laying down a uniform format for visas Therefore only a Regulation can be chosen as a legal instrument. The amending Regulation is based on Article 77 (2) (a) of the TFEU, which replaced Article 62 (2) (b) (iii) TEC. According to Article 6 of Protocol 22 on the position of Denmark, Articles 1, 2 and 3 of that Protocol shall not apply to measures relating to the uniform format for visas. Therefore no recital has been inserted regarding Denmark, as Denmark is in the same position as any other Member State not mentioned in a recital: when adopted, the proposal will apply to it. According to the first paragraph of Article 4a of the Protocol No 21 on the position of the United Kingdom and Ireland in respect of the area of Freedom, Security and Justice annexed to the treaties, the provisions of that Protocol also apply to measures proposed or adopted pursuant to Title V of Part Three of the TFEU amending an existing measure by which they are bound. The United Kingdom and Ireland are bound by Regulation (EC) No 1683/95, which the present proposal proposes to amend. It follows that the provisions of Protocol No. 21 apply. This means that the United Kingdom and Ireland shall not take part in the adoption of the proposed Regulation (article 1 of Protocol No 21), subject to their faculty, under article 3 of Protocol No 21, to notify within three months after the proposal has been presented to the Council that they wish to take part in the adoption and application of this measure. Article 4 of Protocol No 21 also applies, giving the United Kingdom and Ireland the faculty to join the measure after its adoption by the European Parliament and the Council if they have not done so within three months after the adoption of the proposal. To take into account the choices to be made by Ireland and the United Kingdom in the three months following the adoption of the proposal, six possible recital texts are provided between square brackets, of which one or two will be selected as the appropriate one(s) by the European Parliament and the Council, on the basis of the choices made by Ireland and the United Kingdom in the three months following the adoption of the proposal. Regulation (EC) No 1683/95 is part of the Schengen acquis to which Norway and Iceland, Switzerland and Liechtenstein are associated on the basis of their respective association agreements. The proposed amendment should therefore also apply to those associated countries. This provision sets out that the Annex of Regulation (EC) 1683/1995 should be replaced by the new Annex, containing the image and the general description of the new visa sticker. To allow for using up existing stocks, a transitional period of six months is foreseen within which Member States can still use the old visa stickers. There is first the usual provision for the entry into force of the Regulation. Secondly, it is provided that Member States shall introduce the new visa sticker nine months after the adoption by the Commission of an Implementing decision on the supplementary technical specifications. (1)Council Regulation (EC) No 1683/95 1 laid down a uniform format for visas. (2)The current visa sticker, which has been in circulation for 20 years, has to be considered as compromised in view of serious incidents of counterfeiting and fraud. (3)Therefore a new common design should be established with more modern security features to render the visa sticker more secure and prevent forgery. (4)This Regulation respects fundamental rights and observes the principles recognised in particular by the Charter of Fundamental Rights of the European Union. (11)This Regulation constitutes an act building upon, or otherwise related to, the Schengen acquis within, respectively, the meaning of Article 3(1) of the 2003 Act of Accession, of Article 4(1) of the 2005 Act of Accession and of Article 4(1) of the 2011 Act of Accession. (12)As regards Iceland and Norway, this Regulation constitutes a development of the provisions of the Schengen acquis within the meaning of the Agreement concluded between the Council of the European Union and the Republic of Iceland and the Kingdom of Norway concerning the latters' association with the implementation, application and development of the Schengen acquis 2 which fall within the area referred to in Article 1, point B of Council Decision 1999/437/EC 3 . The Annex to Regulation (EC) No 1683/95 is replaced by the text in the Annex to this Regulation. Visa stickers conforming to the specifications set out in the annex to Regulation (EC) No 1683/95 which are applicable until the date referred to in the second paragraph of Article 3 may be used for visas issued until six months after that date. It shall apply from nine months after the adoption of the further technical specifications referred to in Article 2 of Regulation (EC) No 1683/95. (1) Council Regulation (EC) No 1683/95 of 29 May 1995 laying down a uniform format for visas (OJ L 164, 14.7.1995, p. 1). (2) OJ L 176, 10.7.1999, p. 36. (3) Council Decision 1999/437/EC of 17 May 1999 on certain arrangements for the application of the Agreement concluded by the Council of the European Union and the Republic of Iceland and the Kingdom of Norway concerning the association of those two States with the implementation, application and development of the Schengen acquis (OJ L 176, 10.7.1999, p. 31). (4) OJ L 53, 27.2.2008, p. 52. (5) Council Decision 2008/146/EC of 28 January 2008 on the conclusion, on behalf of the European Community, of the Agreement between the European Union, the European Community and the Swiss Confederation on the Swiss Confederation's association with the implementation, application and development of the Schengen acquis (OJ L 53, 27.2.2008, p. 1). (6) OJ L 160, 18.6.2011, p. 21. (7) Council Decision 2011/350/EU of 7 March 2011 on the conclusion, on behalf of the European Union, of the Protocol between the European Union, the European Community, the Swiss Confederation and the Principality of Liechtenstein on the accession of the Principality of Liechtenstein to the Agreement between the European Union, the European Community and the Swiss Confederation on the Swiss Confederation’s association with the implementation, application and development of the Schengen acquis, relating to the abolition of checks at internal borders and movement of persons (OJ L 160, 18.6.2011, p. 19). 1. An integrated colour portrait of the holder produced to high security standards. 2. An optically variable device (‘Kinegram’ or equivalent) shall appear in this space. Depending on the angle of view, the letters ‘E’, ‘EU’ and kinematic guilloche lines become visible in various sizes and colours. 3. This box shall contain the three-letter country code as set out in ICAO Document 9303 on machine-readable travel documents of the issuing Member State in optically variable colouring. Depending on the angle of view, it shall appear in different colours. 4. The word ‘‘visa’’ and the issuing Member State in capital letters shall appear in this space. 5. This box shall contain the 9-digit national number of the visa sticker in horizontal orientation, which shall be pre-printed in black. A special font type shall be used. 6. This box shall contain the 9-digit national number of the visa sticker in vertical orientation, which shall be pre-printed in red. A special font type shall be used, different from the one used for box 5. The ‘number of the visa sticker’ is the three-letter country code as set out in box 3 and the national number as referred to in box 5 and box 6. 7. This box shall contain the letters ‘EU’ with a latent image effect. These letters shall appear light when held flat and dark when turned by 90°. 8. This box shall contain the codes according to box 3 with a latent image effect. This code shall appear light when held flat and dark when turned by 90°. The words designating the boxes shall appear in English and French. The issuing State may add a third official Community language. However, the word ‘‘visa’’ in the top line may appear in any one official language of the Union. 9. This box shall begin with the words ‘valid for’. The issuing authority indicates the territory in which the visa holder is entitled to travel. 10. This box shall begin with the word ‘from’ and the word ‘until’ shall appear further along the line. The issuing authority shall indicate the period of the visa holder’s stay as authorised by the visa. Further along the line the words ‘duration of stay’ (i.e. duration of applicant’s intended stay) and again ‘days’ shall appear. 11. This box shall begin with the words ‘type of visa’. The issuing authority shall indicate the category of visa in conformity with Articles 5 and 7 of this Regulation. Further along the line the words ‘number of passport’ (after which the holder’s passport number shall appear) and ‘number of entries’ shall appear. 12. This box shall begin with the words ‘issued in’ and shall be used to indicate the place of issue. Further along the line the word ‘on’ (after which the date of issue shall be filled in by the issuing authority) shall appear. 13. This box shall begin with the words ‘Surname, Name’. 14. This box shall begin with the word ‘remarks’. It shall be used by the issuing authority to indicate any further information which is considered necessary, provided that it complies with Article 4 of this Regulation. The following two and a half lines shall be left empty for such remarks. In addition, part of this box could be used for a future 2D barcode if included in the common technical specifications. 15. This box shall contain the relevant machine-readable information to facilitate e.g. external border controls. The machine-readable zone shall contain a printed text in the background printing, indicating the codes according to box 3 and ‘European Union’ in different languages. This text shall not affect the technical features of the machine readable zone or its ability to be read. 16. This box is reserved for the possible addition of a common 2D barcode."